Hi, I am interested in your 1977 Ford F150 (stock #5099-CHA) listed on Autotrader for $32,995. I'd like to get more information about this vehicle and confirm its availability. 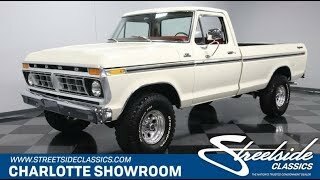 This 1977 Ford F-150 Custom combines classic looks with serious V8 power, long bed versatility, and a go-anywhere 4x4 drivetrain. So you get a true vintage package that still knows how to get the job done. Crisp white paint has a timeless style. So do the sturdy lines of a classic Ford F-150. And this ruggedness only gets better on a truck with a lifted 4x4 stance and long bed profile. They even made a solid investment in places like the bumpers, trailing mirrors, and polished Mickey Thompson wheels to give this some nice shine. But more than just look good, this truck still has all the right work-ready function you desire. With liner paint in that big bed, rear step bumper, and a proper trailer hitch, this is the one that can do the chores and tow the toys. Inside, the white continues as an accent against a bold red. You can tell by the freshness of the seat, door panels, dash pad, and carpeting that they made a solid investment on the interior. This has a great classic feel, right down to the vintage steering wheel and factory gauges. But youll also notice an upgrade to an AM/FM/CD stereo. This means your classic truck experience can still include modern tunes. Fords 390 cubic-inch V8 is looking great under the hood. The bold blue block, shining valve covers, matching air topper, and overall fresh setup really radiates from within the dark engine bay. The V8 inhales deeply with an Edelbrock four-barrel carburetor and Weiand intake. It exhales through headers that add even more power while also feeding the new dual exhaust. You have complete control over this big V8 power thanks to the four-speed manual transmission. Plus, it really knows how to use its muscle when the pavement ends thanks to a two-speed 4x4 transfer case and BF Goodrich All-Terrain T/As. When you just feel like driving through town, this makes it easy with good anytime features like power steering and power brakes w/discs up front. Great looks, a powerful motor, and true truck ability this F-150 is the vintage pickup with all the right pieces for work and play. Call now!